With hours to go before the U.S. copyright office’s deadline to receive comments about the Digital Millennium Copyright Act (DMCA’s) “notice and takedown” process, digital rights group Fight for the Future and popular YouTube channel ChannelAwesome launched an online campaign and viral video encouraging Internet users to submit comments about the many ways that the DMCA is abused to censor and take down legitimate content from the Internet, stifling innovation, cultural creation, and freedom of speech. The campaign was launched late Thursday afternoon. As Monday morning the video has already been viewed more than 360,000 times. The campaign has already generated more than 86,000 comments before the Copyright Office’s Friday deadline, and has since collected an additional 11,000, which will be delivered to the Copyright Office as a petition. The comments are in support of stronger fair use and free speech protections in the DMCA. 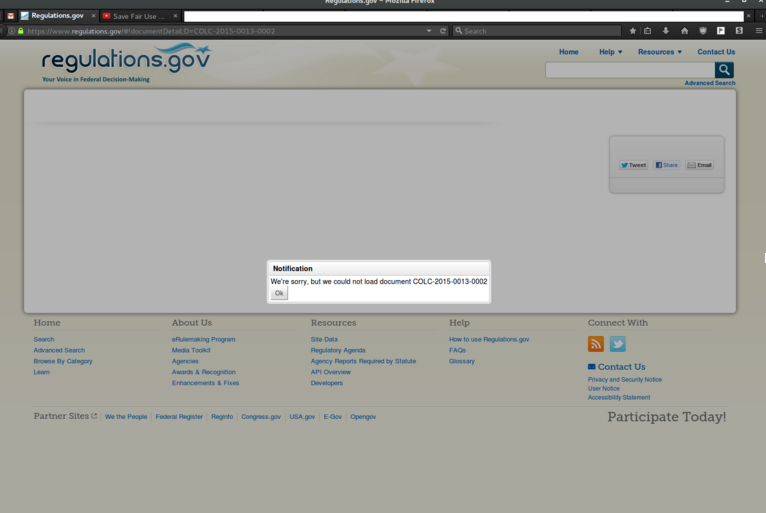 Before the launch of the campaign last week, the Copyright Office had only received 80 (yes, eighty) comments. As of March 2nd, they had only received 23. The flood of new submissions late last week repeatedly crashed the website that the government set up to receive feedback. Given that this site is the only method for concerned Internet users to submit comments, Fight for the Future is calling on the Copyright Office to consider the additional comments that came in after the deadline.